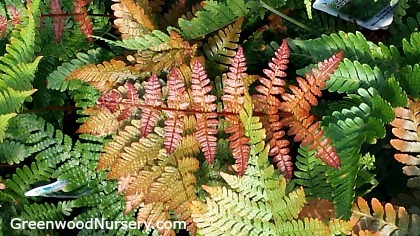 Autumn Radiance fern spreads like a groundcover with a spreading habit. New fronds in spring emerge in colors of red, orange, bronze and gold maturing to a deep green. Adds beautiful colors to woodland and shaded garden settings. Great drought resistant fern that would normally grow in moist settings. Excellent companion plants include Coral Bells and Bleeding Hearts. Orders shippint to CA or AZ will be bare rooted and root washed before being prepped for shipping.